By: Erik Hyrkas on November 6, 2017. Samsung and Apple have had an interesting relationship history of suing each other, mocking one another, and even building parts for each other over the years. 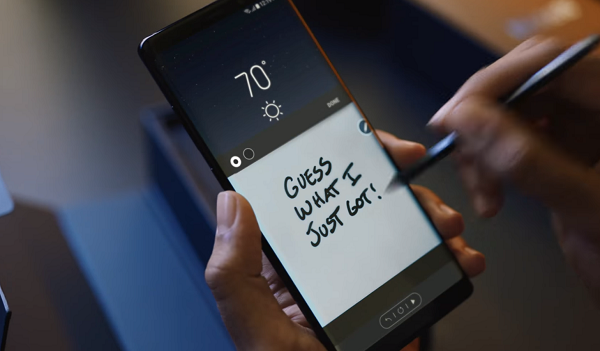 And Samsung’s new ad for Galaxy Note 8 is no different. The commercial takes snipes at Apple, depicting a forlorn iPhone owner being constantly burned by iPhone models’ lagging features. In the ad (below), Samsung shows us a man and his evolving relationship with his beloved Apple devices and his girlfriend, who owns Galaxy phones instead (obviously). Despite storage issues, tiny screen sizes, a waterproofing failure, and finally, the headphone jack removal, he persists waiting in line for the new iPhone from 2007 until 2017–when he can’t take it any longer. You know what happens. Yes, he buys the Samsung Galaxy Note 8. The ad is titled “Growing up,” and it perfectly encapsulates the constant fight for features between these two companies, alluding to Apple’s stubborn 16GB storage issue with its high-quality photographs, continuing to have screens smaller than competitors as recent as the iPhone 5/5S, and of course holding out on wireless charging and waterproofing. That said, Samsung obviously made no mention that iPhones generally don’t catch on fire (i.e. Battery-gate of the Note 7 in 2016). The Note 8 was revealed in September with a giant 6.3″ display and all the state of the art specs one expects in a flagship, including the ability of external MicroSD storage, and yes, that 3.5 mm headphone jack. That’s one round for Samsung on the internet today. Let’s see if Apple hits back. Thoughts of your own on the iPhone/Galaxy rivalry? Let us know in the comments.